bridge – "After all it was a great big world… with lots of places to run to." 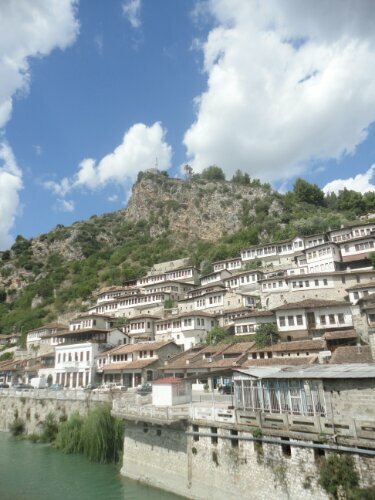 Berat is a city in central Albania. It is a UNESCO World Heritage sight, and known for its Ottoman architecture. It’s also a city built on the hillsides on either side of a river. 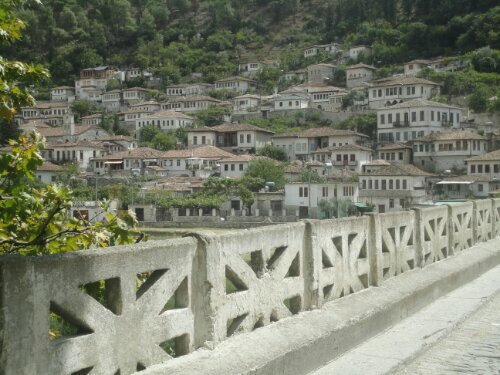 The hillside location, and the Ottoman architecture give it the nickname ‘Town of a Thousand Windows.’ The houses looks as though they are stacked on top of each other, as the hills (mountains) are quite steep. The old town was really fun to walk through. 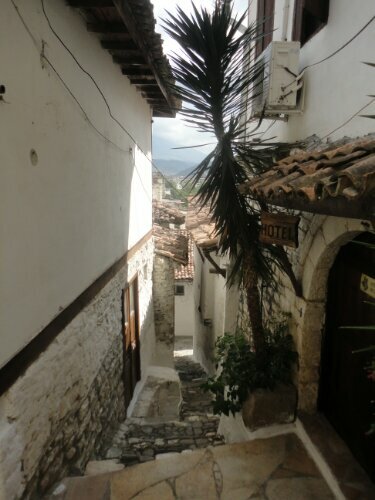 It was full of impossibly narrow cobblestone ‘streets’ that no car would ever be able to drive on. 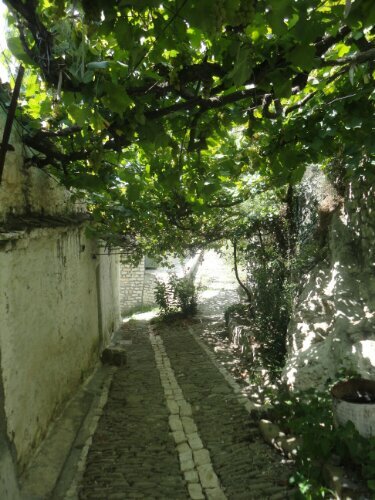 The streets, buildings, fences, railings and pretty much everything else possible seemed to be covered in grapes. It just seemed like a magical place to walk through. I really enjoyed it. I did love the old bridge in the city. Great views of the town. 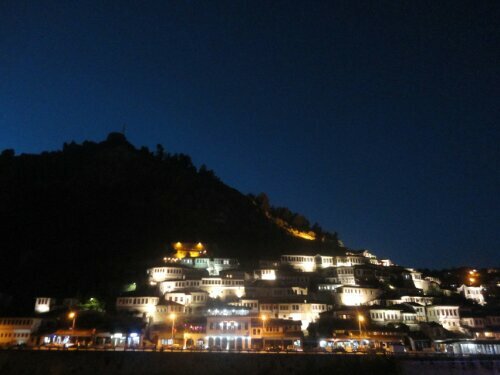 Berat is especially gorgeous at night, when the windows light up. 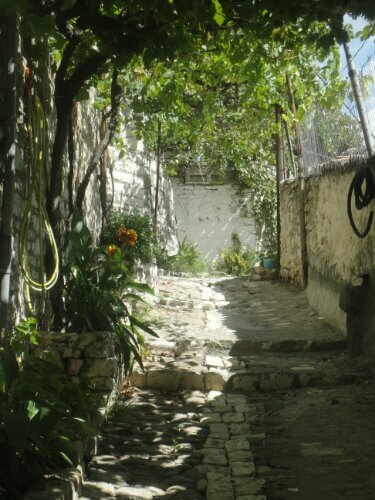 All in all, a really fun few days, and definitely one of the most picturesque places I’ve seen in Albania. 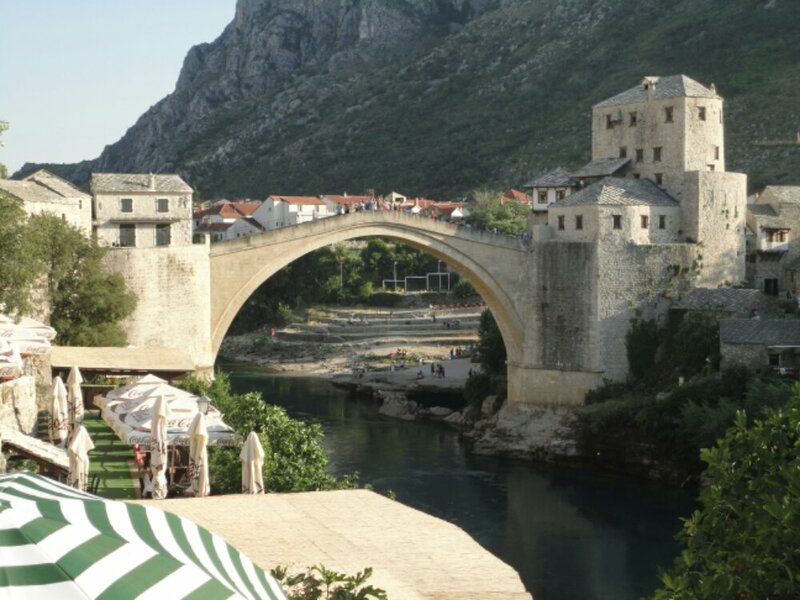 I don’t know many cities that are famous for one thing the way that Mostar is famous for it’s Old Bridge. Pisa comes to mind. And… that’s about it. I came into Mostar a little skeptical, a) it’s just a bridge. b) it’s not even an old bridge. After being completely destroyed in the war, it was rebuilt in 2004. But, though I do partially blame the layout of the city, (seriously, how is it possible that EVERY road seems to lead directly to the bridge?) 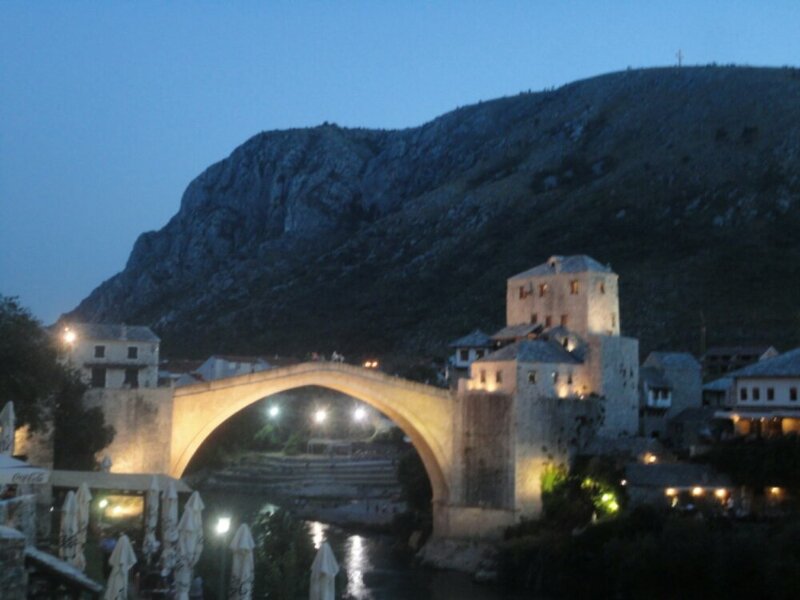 No matter what I did while I was in Mostar, I ended up back at the bridge, content just to hang out and look at it. Coffee in a cafe during the hot part of the afternoon? Or… Ice cream down at the edge of the river, under the bridge. In the afternoon, you can watch guys from the local diving team jump off the top of the bridge. Now, please look at the picture and realize the bridge is TALL. These guys are jumping from a height that I didn’t even want to stand close to the railing while looking over. It’s definitely impressive. Also, be aware that it is really really hot here every afternoon. And the water is really really cold. Really cold. Stuck one foot in, and it was bright red when I pulled it out. Cold. So this jump is impressive. But they’re so annoying about it. First they collect the money. Then they wait a bit, and then collect more money. And they don’t wait for people to come up and offer money, they pretty much demand it. So I paid them my money. And then waited for almost 40 minutes. There is no time frame for the jumping, so you just have to wait till it happens. And once I paid, I had to stay. I’m cheap! And when they do jump it is over very fast. But it certainly looks very cool. I think the bridge is at it’s most beautiful when the lights come on, just after sunset. The city starts to glow just a little, and the white bridge just seems to glow. 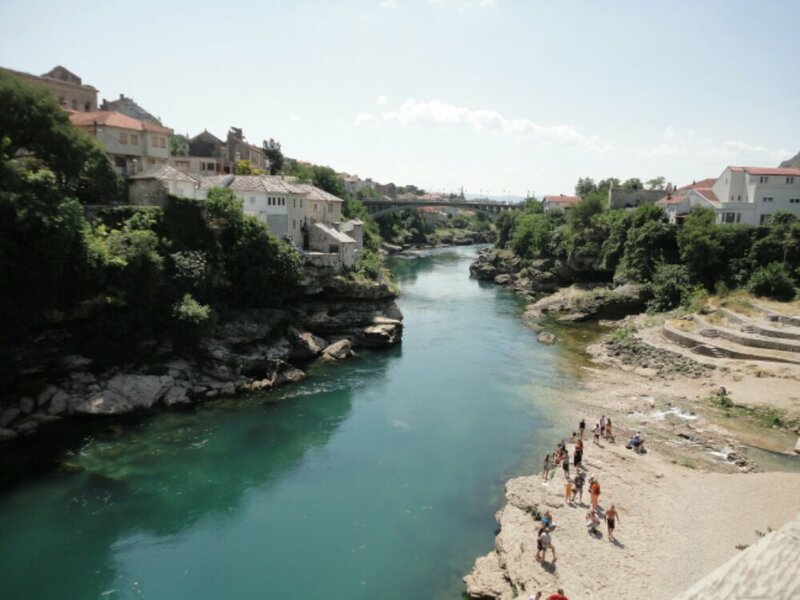 Now, for all the talk of the bridge, I really felt like the river was actually the most beautiful thing in Mostar. In Chicago, we love our river. But it has nothing on the Neretva. (Except size… Chicago River is definitely bigger… does size matter?) The banks of the river are green and lush. 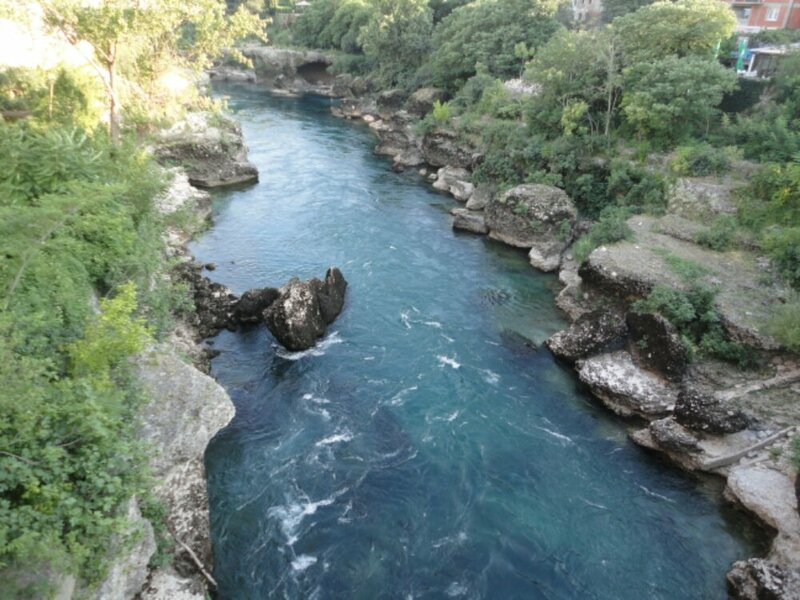 The water is beautiful clear blue green. There is a sandy/rocky area where you can hang out drinking, or just sitting, enjoying the sight of the bridge. All in all, I think it is a worthy site for a city to build it’s tourism around. Probably good for two days or so, but definitely worth the visit.